Noel Meade brought Gordon Elliott's winning streak in the Ladbrokes Troytown Chase to an end as Tout Est Permis ran out a comprehensive winner in the feature event at Navan. Elliott fielded 11 of the 25 runners as he went in search of a fifth successive victory in the three-mile race, but he did not even get one horse in the frame as Tout Est Permis (9-1) outstayed his rivals in style. Ridden by Sean Flanagan, Tout Est Permis moved up to challenge Mr Diablo - who had raced prominently throughout -at the penultimate obstacle as all other contenders began to drop away. Still only a five-year-old, the grey then found plenty on the run to the last to jump the final obstacle with a couple of lengths in hand, galloping four and a half clear at the line. Mr Diablo, a 50-1 shot, kept on for second - with Magic Of Light (20-1) a further six and a half lengths away in third. Meade was last successful in the Troytown with Heist back in 1997 and he was thrilled to land the main prize for owners Gigginstown House Stud. He said: "Eddie (O'Leary, racing manager for Gigginstown) said to me the other morning 'Are you not going to run the other two in it?' and I said 'No - you can only win it once'. "I was very sweet on him, and he worked a bomb the other day. I felt if we just kept him together from then until Sunday, he'd win. "Everything went according to plan, apart from nearly getting wiped out over the far side. He travelled and jumped brilliant. It's the biggest race here, and a huge race to win. "Sean is a big help to me both at home and on the track. He says things as they are, and is very constructive in his comments. He's riding very well." Tout Est Permis was previously trained by Mouse Morris and was having just his second start for Meade following victory at Galway last month. 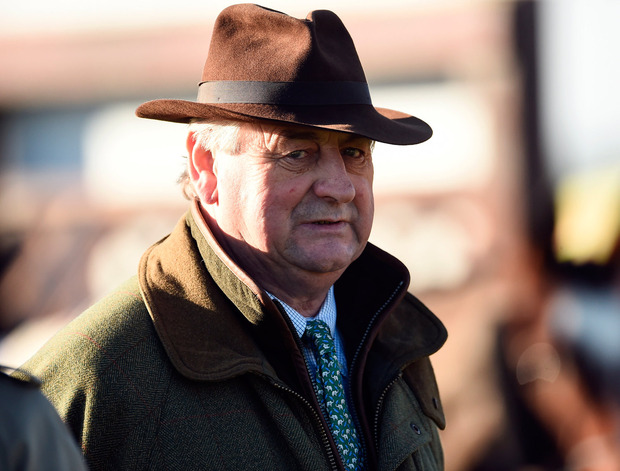 Meade added: "He's a nice horse - we've run him twice, and he's won well both times. The Paddy Power Chase at Leopardstown is a possibility, but he'll nearly have top weight in that now."